64-year-old Tom Izzo coaching 19-year-old Aaron Henry. I’ll start with a simple two-part statement. 1) If you’re a coach or a parent or a boss, you have unquestioned and absolute power. 2) If you give in to anger similar to what’s pictured above, you are an ineffective and dangerous bully. Got it? Great. Now then. Onto the meat of this story. Tom Izzo is the 64-year-old men’s basketball coach at Michigan State University. He has over 600 career victories, seven Final Four appearances, and one national title. He makes $3.65 million per year. He is an accomplished and successful basketball coach. Yesterday, Izzo and his 2-seeded Spartans were locked in a surprisingly competitive game against 15-seeded Bradley University. During the 2nd half, for reasons that remain unclear to me, he targeted his ire and discipline at Aaron Henry, a 19-year-old unpaid student athlete on his team. This is a bit extreme for Izzo, but overall it’s nothing new. It’s how he coaches. He’s an emotional guy. Passionate. Fiery. A REAL LEADER. doesn’t matter that Henry and his teammates were on a 10–0 run when this outburst happened. It doesn’t matter that his other student athletes are literally holding him back from unloading on their teammate. Leadership, idiot! Toughen up! I’m a dad. My boys are 4 and nearly 2, and they’re good kids with good hearts. But they have their moments, and I’m not always peaceful and calm when it’s time to discipline. I’ve gotten angry. And when that happens, when I show that anger to these tiny humans I’m already exponentially more powerful than, I’ve lost. Completely and totally. Sure, they’ll stop acting up in the moment. They’ll be on their best behavior. But I’ve wounded them. My angry facial expression, my violent bodily motions, my terrifyingly big voice — all are indelibly stamped into their brains. The image will be there for years, for decades, for the rest of their lives. They’re also — and this is the biggest heartbreak — far more likely to wield anger on all the people unfortunate enough to be born to them, coached by them, or employed by them. Anger is a choice. You don’t have to hulk out just because it’s what you think men are supposed to do. You don’t have to scream. You don’t have to hit. You don’t have to be a bully. That’s what children do. You already have the power. Now take a breath, quiet the rage, and use that power with wisdom and care. Let’s now go live to Izzo’s postgame press conference when he was asked why he went after Aaron Henry like he did. Izzo: There were some things Aaron didn’t do a very good job of. I did get after him and he did respond and he did make a couple big buckets and he did make some pretty big free throws. You see? The screaming works! The blackout rage works! The clenched fists work! Coaching! Leadership! MARCH MADNESS, BABY! 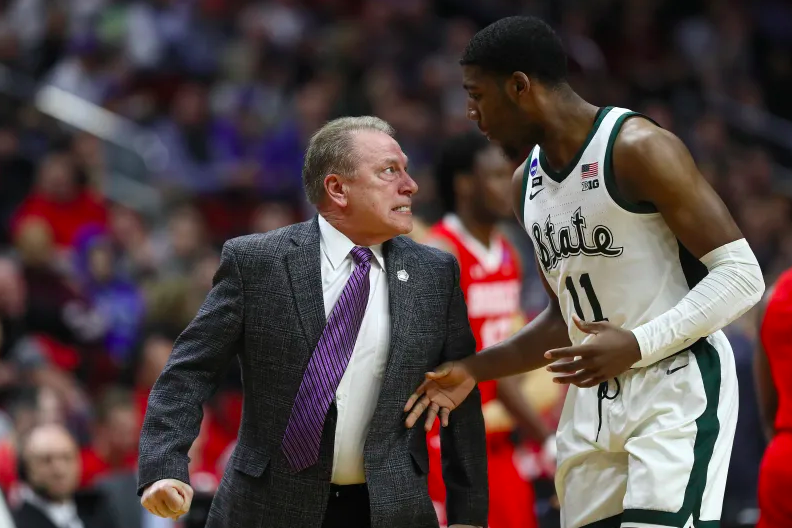 I’m not sure if Izzo was blacked out from the rage, but after that coaching spectacle, Aaron Henry played like a deer in headlights. Passed up open shots, second guessed himself constantly. Almost like he was more afraid of screwing up than being free and playing naturally. He played like kid who was scared. I wonder why.